Terry Sullivan was reinstated as the president of the University of Virginia. The vote to reinstate was unanimous. Opening the meeting, board rector Helen Dragas made another apology regarding the handling of the situation. She then turned the meeting over to W. Heywood Fralin, who made a motion to reinstate her. After it was properly seconded, Dragas made another statement. “It’s time to bring the UVA family back together,” Dragas said, the first indication that she would support the reinstatement. After a roll call vote, a second motion was made, also by Fralin. This one was a vote of confidence for Dragas and passed on a voice vote. UPDATE: Statements are rolling in. I am heartened by today’s unanimous decision by the Board of Visitors to reinstate President Sullivan. I am confident that the University of Virginia will emerge stronger than ever and continue to move forward as an exemplary educational institution critical to the future of our Commonwealth. I want to thank the members of the Board of Visitors of the University of Virginia for their conclusive action today to bring the issue of the Presidency of the school to a close, as I directed last Friday. Since its founding in 1819, the University of Virginia has not only been the Commonwealth’s educational flagship; it has been one of America’s as well. An academical village dedicated to the pursuit of knowledge. A school built on honor and excellence. A school with renowned and dedicated faculty and students that I trumpet around the world. The past few weeks have not been easy for the University, and all those who love it. There has been too little transparency; too much vitriol. Too little discussion; too much blame. Now, with today’s Board action, the time has come for Mr. Jefferson’s University to move forward. The statements made today by Board members and President Sullivan were poignant and gracious and set the right tone for collaboration ahead. I congratulate Dr. Teresa Sullivan on her reappointment to the post of President. Dr. Sullivan, and other presidents, have been valuable partners with our Administration in advancing important higher education initiatives. In Charlottesville, Dr. Sullivan’s leadership has added nearly 1000 new slots for in-state students at the University, while reducing this year’s tuition growth to the lowest increase in a decade. She cares deeply about the University. It is evident she is well-regarded in the University community. She steps back into the President’s office with the best wishes of this Administration and the University community. The Commonwealth of Virginia must have a strong and vibrant University of Virginia that is a global academic leader. Members of the Board have faced much criticism over the past two weeks. 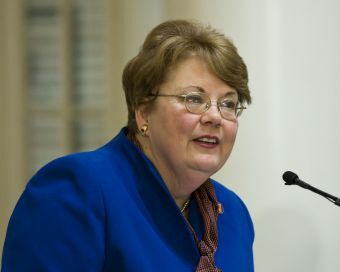 Specifically, much of that criticism has been directed at the first woman to serve as Rector of the Board of Visitors. This has been very unfortunate and counterproductive. It has not been in keeping with traits long associated with the University such as civility in discourse and open dialogue. The Board itself admittedly made mistakes and did not act with the procedural transparency that should be accorded such a significant decision. The Board did lay out, in subsequent days, pressing concerns that led members to believe changes at the University were necessary. The General Assembly and I, with great input from Dr. Sullivan, and other university presidents and boards, have set in place a road map for reform in the Top Jobs legislation unanimously passed last year, and we have put significant new dollars behind those goals this year. The objectives of expanding access to education, reducing tuition increases and student debt, facilitating more innovation and research in an atmosphere of academic freedom, are embraced by all. Now, I ask that Dr. Sullivan and the Board work closely together to address those issues and set in motion the strategy and tactics to tackle these challenges. The University of Virginia did not become a top-ranked University by avoiding challenges, nor did it become one of America’s preeminent institutions of higher learning by failing to embrace change in the pursuit of excellence. Today, in settling this disagreement within the family, the University of Virginia has taken another step forward towards reconciliation and the pursuit of excellence. I ask all concerned Virginians, no matter which side they may have taken over the past few weeks, to now take that step forward as well. The Board has appointed Dr. Sullivan as President of the University of Virginia. Now, the Board and Dr. Sullivan must, and will, work together to ensure that the University of Virginia continues to be one of the world’s foremost institutions of learning and discovery in improving the human condition. That accomplishment is critical to the future welfare and prosperity of our beloved Commonwealth; the further diffusion of knowledge to the benefit of all; and greater access to the American Dream for generations of Virginians to come.